A great tool for managing your employee working times - anything from regular office hours to simple or even complex shifts and rotas. WhosOffice is customisable to suit what time your shifts start/end and lets you swap and adjust shifts as necessary. Viewing staff hours across a month and manning levels allows you to plan on demand. Each period of work can be built using a pattern code which lets you specify the start and end time, a two-digit code and a few other settings regarding paid time (in case breaks are unpaid for example). From these pattern codes, you can easily create a work pattern to build your shifts/rota. Using the WhosOffice planner tool, you can plot out these work patterns to repeat as required either up to a certain point in time or to run continuously. Ample reports let you know who has worked when and how many hours they have worked (or will have worked). Easy distribution tools let you quickly email your staff their next shifts or you can even offer available shifts based on demand and manning levels. Assigning an attribute (to a shift) means you can define what work is planned for that particular shift(s). i.e. you may have a particular project that is assigned to a person. Adding competencies to your staff makes them also available during planning to enable you to see that you have the right people working at the right time. 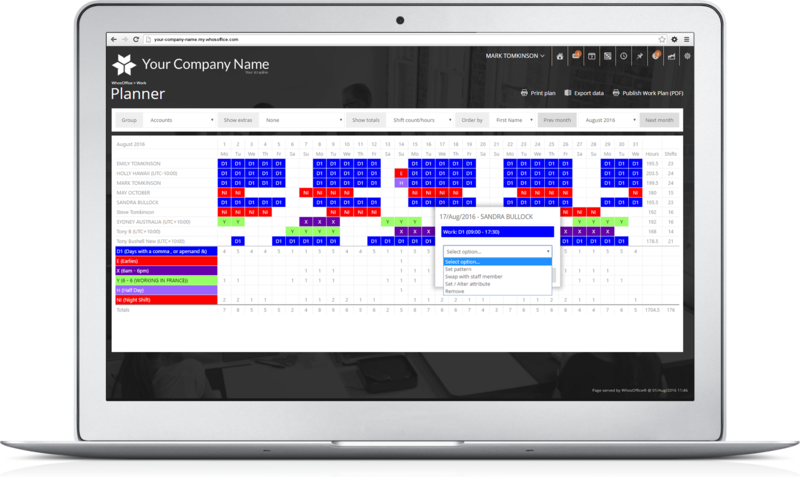 The easy to use work planner tool lets you create as many shifts patterns as you need whilst having complete flexibility over changes or swaps etc. You can view forward to any point in time to see how shifts fall on which dates in the future. Along with the working times, you can also see staff overtime and leave to help you plan effectively. Posted on Wed, 24th Apr 2019 New Android WhosOffice App available - install today Download the brand new WhosOffice app on Android today. Take the system with you on the move! Posted on Thu, 14th Mar 2019 How can you easily manage flexible working? Although we live in an age where your ‘office’ is anywhere with an internet connection and ‘office hours’ can be any time of the day, the flexible working movement has stalled. Posted on Fri, 11th Jan 2019 iOS and online apps dashboard update We have released an update to the dashboard UI for iOS and Online Apps to show more detail on your forthcoming events. Posted on Thu, 20th Dec 2018 New iOS WhosOffice App available - Download today We are proud to announce the brand new WhosOffice app available for iOS today. Taking the system you have come to know and depend on, from your desk to your mobile. Start your long trial today get until Sunday, 26th May 2019 absolutely FREE! No credit card, no setup fees and no hidden costs! © X:drive Computing Limited 2019. All rights reserved.